Analysis: Combining what we know about limestone and soil, and applying that to a slope allows us to be predictive of topsoil makeup. It has always been my contention that the slope determines a vineyard’s soil type, and it is the soil type that is a major factor in wine character. Because many vineyards carry through the various degree of slope through the profile a hillside, the soils vary greatly from top to bottom. Water and slope work together to cause this. Rainwater both causes the development of clay on the hillside, and is the reason clay and other fine earth fractions will not readily remain on a slope. But lets start with a hillside typical of one found Burgundy, and the fractured stone and scree and colluvium that resides there. The 315 meter elevation represents a grand cru vineyard profile. The 350 meter profile represents a steeper rise which would be typical of a premier cru, which sits above a grand cru located on the curb of the slope. This added elevation and degree of slope, greatly changes the soil type at the top of the hill and decreases the soil depth, and at the same time increases richens and thickens the soil type, and deepens the soil in the lower grand cru section. The typical Cote de Nuits hillside vineyard rises about 100 meters (328 feet). The base of many appellations sit at roughly 200 to 250 meters elevation, and here the vineyards are quite flat. As you move toward the hillside (facing uphill) it is common for there to be roughly a half a degree rise on the lower slopes. After 300 to 400 meters, the slope gently increases over the next 150 to 200 meters to roughly a 2 to 3 percent slope, where the grand crus generally reside. The upper slopes can rise dramatically in places, depending on the how wide the sections of bedding plates between faults, and pulled out and down with the falling Sôane Valley, and how much the edges of those bedding plates have fractured and eroded, also sliding down the hill. Areas like Chambertin, this slope remains moderate and the vineyard land remains grand cru to the top of the slope. However, above Romanee-Conti, the slope becomes much more aggressive, and the classification switches to premier cru at the border of Les Petits Monts. This uptick in slope, and the change in classification is common, but not universal in its application. As most things in Burgundy, there are a lot of exceptions to classification boundaries, notably for historical /ownership reasons. If we were to strip away the fine earth fractions what we would expose is a fractured limestone base. Here the exceptionally shallow soil of Meursault Perrieres is peeled away and the limestone below is laid bare. The very shallow depth of soil, despite the relatively shallow slope suggests significant erosional problems. If you could magically strip away all the dirt from the fractured limestone base of the Côte d’Or, leaving only a coarse, gravelly, sandy, limestone topsoil, and watch the soil development, this is what would happen: Over time, with rainfall, carbonization (the act of making the calcium carbonate solvent by carbonic acid in rainwater) would produce clay within the fractures of the stone. This new clay, is called primary clay (see Part 2.1) and gravity would have it settle to the lowest point in the crevices between the stones, below actual ground level. This primary clay will be rendered from weathering limestone everywhere on the Côte, from the top of the slope to the bottom of the slope, and tends to develop into a 9:1 to a 8:2 ratio of limestone to clay. This is the origin of limestone soils, and it is called… marly limestone. I developed this diagram to express the different combinations and geological names of limestone mixed with clay and their agree upon percentages by the geological community. Marl dominates a full third of this diagram from 65 percent limestone/35 % clay to 65% clay / 35% limestone. There are two common (and well-defined) terms that describe essentially the same soil type, applying different names and using differing parameters. This represents the purest, least mixed soil type on the Côte, and it is found on steeper (typically upper) slopes. Marly Limestone: containing 5-15% clay and 85-95% carbonate. source: The Glossary of Geology, fifth edition. (julia a. jackson, james p. mehl, klaus k. e. neuendorf 2011). This is new, primary clay is not sorted by size, causing it to be rough in texture. Also of note, it is not plasticky like potters clay (kaolin clay) because of the irregularity of the particle size, which doesn’t allow its phyllosilicate sheets to stack, like it will once it is transported by water and reforms lower on the slope. 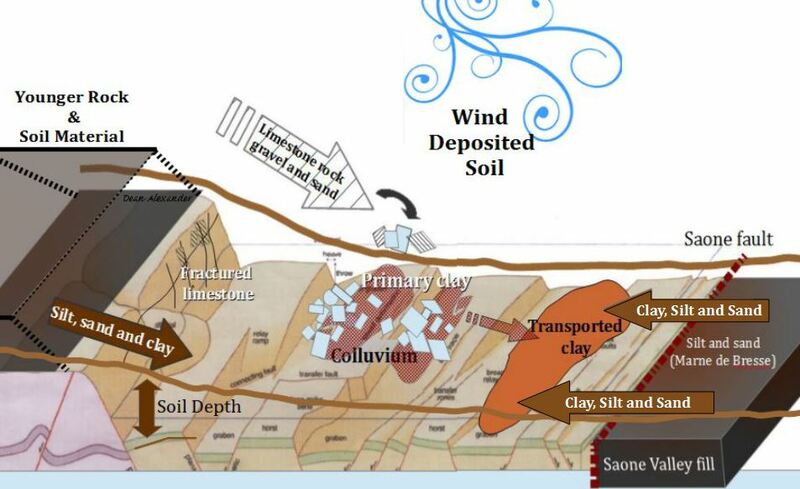 The Limestone to Clay diagram can virtually be tilted on upward and applied to the Côte to represent its topsoil makeup. The only part of it is missing is pure limestone because wherever there is limestone, clay has weathered from it. 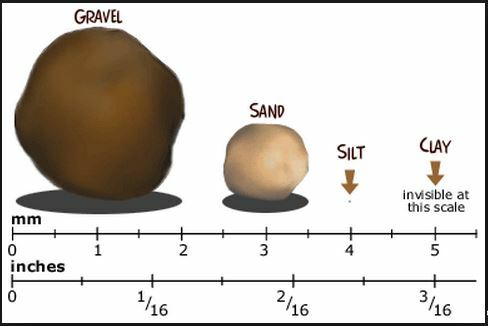 It is no accident that you can turn this progression of limestone to clay into a general slope-soil diagram. The reason, as always, is water. The fact that limestone and clay continues to exist in this 9:1 to 8:2 ratio (the stone does not continue to accumulate clay although it continues to develop it) allows us to deduce two things: First, the clay gains sufficient mass (depending on how close to the surface it is developing) where it can be eroded down the hill by rainwater runoff when it reaches roughly a 5% to 20% proportion of the limestone soil matrix. This static ratio also suggests that it exists only where erosion is a constant condition, meaning marly limestone can exist only on limestone slopes. It is erosion that maintains this general ratio of clay to limestone; limestone which will always produce primary clay as long as there is rainwater present. Of course, there may be other materials as well present in this mix, perhaps fossils, quartz sand, or feldspar. 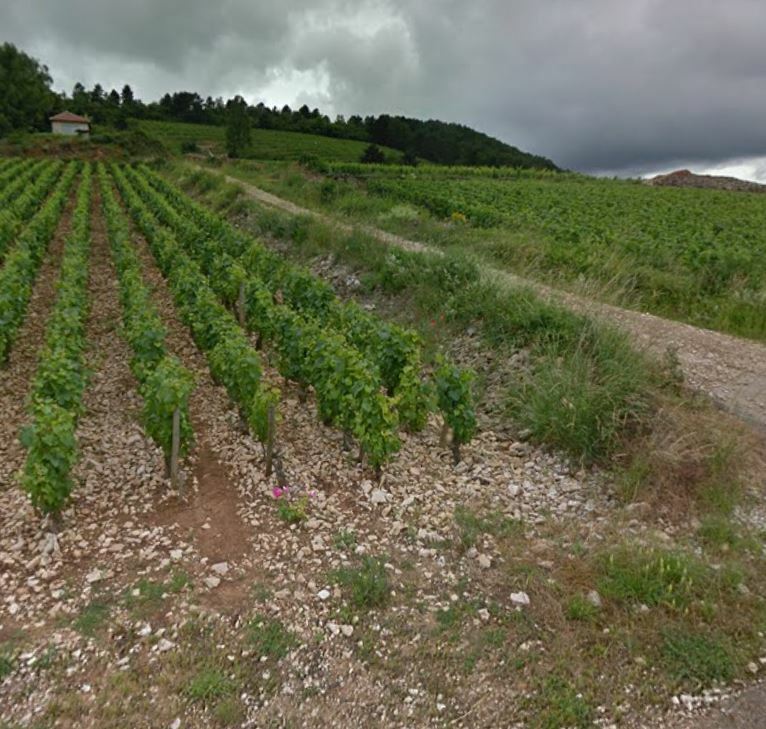 I asked Pierre-Yves Morey, a noted winemaker in Chassagne, what was the texture, or the feel, of this marly limestone soil, is, and he described it simply as compact. “You would have to come to Burgundy and come see it.” I was looking for a little more richness to his description, but that is what I got. So… the definition of compact. The Glossary of Geology, 5th ed., defines compact (among other meanings) as “any rock or soil that has a firm, solid, or dense texture, with particles closely packed.” So there you have it. Clayey Limestone/Marly Limestone. The next incremental level of limestone to clay (75% to 25%) is not commonly cited, but sometimes referred to as Argillaceous Limestone or Hard Argillaceous Limestone. As a pure descriptor, this name isn’t especially helpful, since Argillaceous means clay. I also found another reference that called this ratio of limestone to “Mergelkalk” which is the German for “marl chalk”, and this name indicates at least a progressive amount of clay over clayey limestone. This ratio of limestone to clay is not widely used, because, I suspect, it exists in the fairly narrow area of transition areas between marly limestone and Marl. We might presume this ratio of limestone to clay appears not on the steeper slopes (generally above), but rather as the slopes grow more gentle, where to transported clay (from the steeper grades) may begin to flocculate as the rainwater runoff slows, adding to the primary clay growing in situ. Because primary clay is more prone to erosion because of its mixed sized particles make its construction less cohesive, it is likely some of the primary clay developed in this lower location will be eroding further downslope, even as finer clay particles traveling in the rainwater runoff are starting to flocculate into transported clay in the same location. With this high ratio of limestone to clay, it would be likely the be a compact soil, but because of the increased amounts of clay, not to mention some of it being transported clay, it will both have more richness and better retain water and prevent rapid evaporation. Incidentally, his ratio of 75% limestone and 25% clay incidentally, is the recipe for industrially made Portland Cement. The beauty of, and the problem with, the word marl is its breadth of meaning. Marl as a term covers a wide variation of soils that contain at least some clay and some limestone, with many other possible components that may have been introduced from impurities on the limestone or from other sources within or outside the Côte. (1) But since we have magically stripped away the hillside, let’s imagine marl of its most simple combination: limestone and clay. Once the proportion of clay has risen to 1/3 of the construction with limestone, it is considered marl. It will continue to be considered Marl until clay exceeds 2/3 of the matrix. This is the definition established by the American geologist Francis Pettijohn 1957 in his book, Sedimentary rocks (p410). Marl is an old, colloquial term that geologists may not have completely adopted until fairly recently. Perhaps it is because of this, that the definition of marl has an uncharacteristically wide variance in meaning, can be applied to a fairly hard, compact limestone soil, to a loose, earthy construction to a generally fine, friable, clay soil. 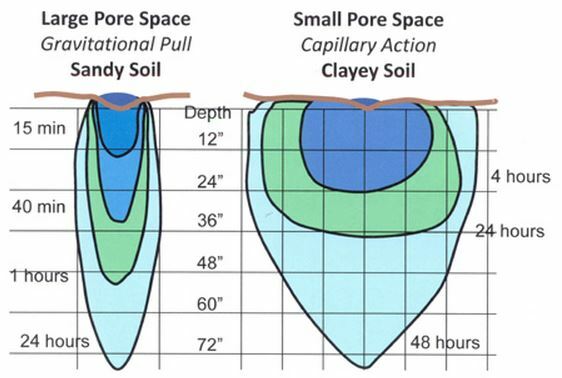 I imagine that on the clay end of the marl spectrum, the soil begins to become increasingly plasticky, due to the increasing alignment of the clay platelets by the decreased lime in the soil. This is purely subjective on my part. 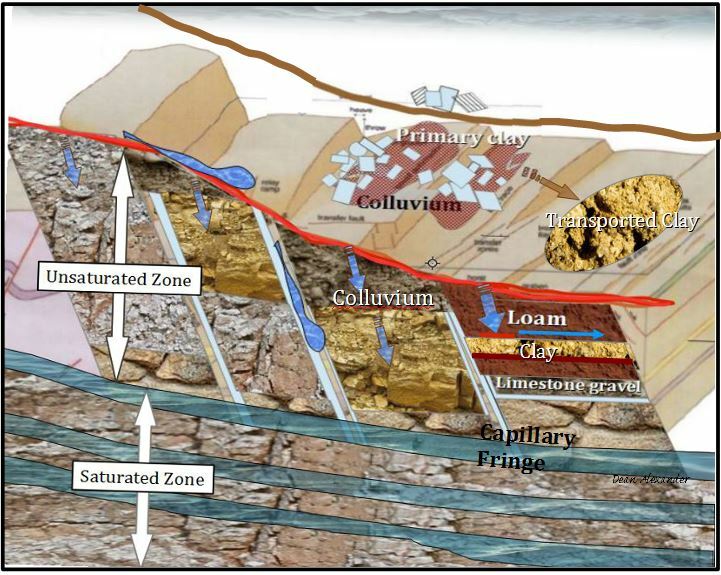 Marl is most often noted in the same positions on a slope as colluvium, at a resting place of not much more than a 4 or 5% grade. To attain a concentration of clay of at least 1/3 (the minimum amount of clay to be marl) rainwater runoff must slow enough for the clay’s adsorptive characteristics to grab hold of passing by like-type phyllosilicate minerals and pull them out of the water passing over it. As you can imagine, in a heavy deluge, with high levels of water flow, this will only happen lower on the slope, but in light rain, with a much less vigorous runoff, this will occur higher on the slope. How far these clay mineral travel down the slope before flocculation all depends on the volume of water moving downhill, and its velocity, which tends to be greatest mid-slope. We can safely deduce that the first marl construction on our magically stripped slope consists of 15% primary clay (maximum) because that is what we started with, 20% transported clay which has been adsorbed to the site, and 65% limestone rubble (rock, gravel, sand and silt). Here, the ratio of stone in the topsoil is lower than in the slope above, because the topsoil is deeper, and the stone represents a small proportion of the ratio. Additionally, it is very possible that some of the primary clay, which is more readily eroded, may have been washed further downslope, in which case the percentage of transported clay would actually be higher. 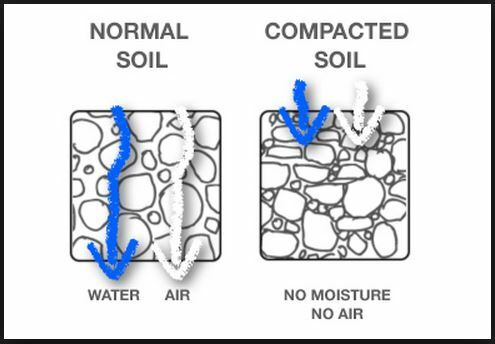 It also stands to reason that the soil level is significantly deeper where marl resides by a minimum of 15%, due, if only because of it’s increased volume of clay to those soil types above if the limestone concentration in the soil remains constant from top to bottom. Of course, we know that fracturing of the limestone, erosion and gravity have moved limestone scree downslope. If you could know that volume of additional limestone that had accrued on the slope, and then factor in the percentage of clay, you could effectively estimate the soil depth. Farther down the slope, marl with 65% clay to 35% limestone, we can assume to have a minimum of 30% deeper soil levels, but again, that depends on the limestone scree that has moved downslope as well. Notes of excavations by Thierry Matrot in 1990 in his parcels of Meursault–Perrières show one foot or less topsoil before hitting the fractured limestone base, whereas his plot of Meursault-Charmes just below it, was excavated to 6 feet before hitting limestone. (3) This indicates, a significant amount of limestone colluvium had developed in Charmes (some of which may have been the overburden removed from the quarry at Clos des Perrières?) that has mixed with transported clay to attain this six-foot depth of marl dominated soil. Wittendal’s work analyzing the vineyards of Burgundy (2004) revolved around statistical methods tracking values of slope and soil type, among other 25 other factors. From that, he plotted the vineyards as data points to try to develop trends and correlations. I was not surprised by his results, as it confirmed many of my assumptions about slope causing the types of soils that develop there. 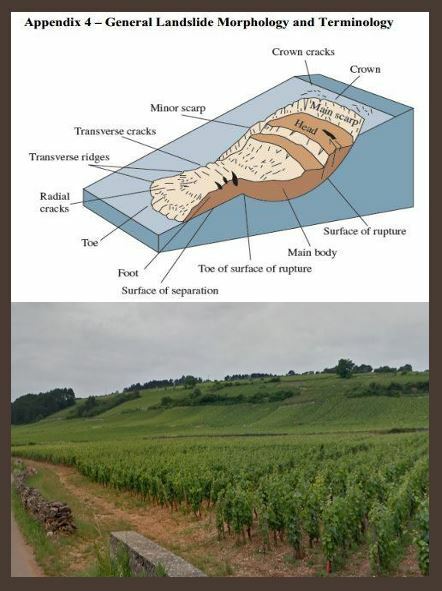 Of note, though, to some degree, his work dispels some of the assertion that marl/clayey soils reside more in Beaune and limestone/colluvium soils reside primarily in the Nuits. Wittendal plots a perfect 50-50 marl to colluvium, as point zero in the center of a four quadrant graph (Figure 8 – The Grands Crus picture components 1 & 2). On the left side of the graph would be the purest expression of marl. This represented as negative four points of standard deviation ( σ ) from zero (the mean). On the right, the purest representation of colluvium is four points positive of standard deviation ( σ) from zero (the mean). Grand Crus on marl soils: more than one standard deviation (neg). Corton Charlemagne (one section with a standard deviation of -3.5, and another section at -1.5 ) Chevalier-Montrachet -1.75. Grand Crus on slightly more marl than colluvium: Romanee-Conti sits on slightly more marl than the mean (-.3), La Tache sits right near zero. Ruchottes inclusion here is at first surprising. But since there appears to be little chance of colluvium to develop on this upper slope, coupled with its shallow soils, it is this soil construct makes sense. In fact, this highlights that Wittendal’s work represents the ratio of marl to colluvium, rather than the depth of marl and colluvium present. It is my contention that the most highly touted vineyards have significant soil depth and typically have richer soils. 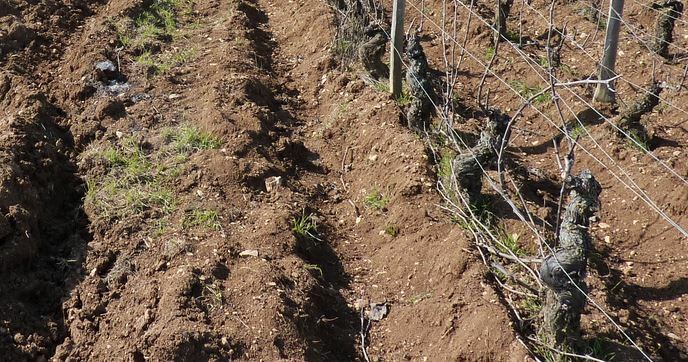 Ruchottes, which many have suggested should not be grand cru, has little soil depth (which is a rock strewn, quite compact marl), and the vines there can struggle in the little yielding Premeaux limestone below. A vine that struggles, despite all of the marketing-speak of the last two decades, does not produce the best grapes. Clay marl seems to be within the defined boundaries of Marl. One would suspect this to be in the 35-45 limestone with the remainder being clay. It is described by the Glossary as “a white, smooth, chalky clay; a marl in which clay predominates.” No specific ratios are given. Marly Clay, and also referred to as marly soils are 15% carbonate and no more than 75% clay. At this point, it seems the use of the word limestone has been discontinued. 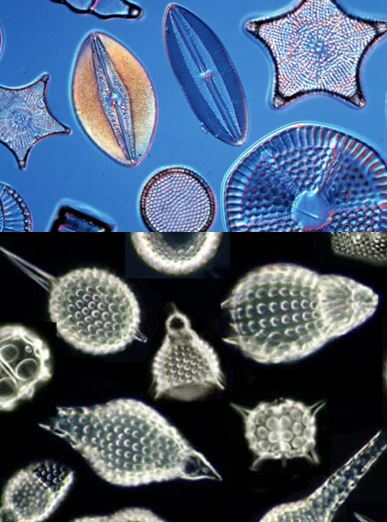 Perhaps at this level we are dealing with limestone sand sized particles and smaller, perhaps with pebbles. There must be silt and clay sized limestone particles before complete solvency, but I have never seen mention of this. It is likely the carbonate is solvent, influencing, and strengthening the soil structure, and affecting to some degree, clay’s platelet organization? As much as I have researched these things, I have never seen this written. The soil just is the soil at this point. Deceptive here is the need to discern limestone sand from quartz or other sands. Limestone sand will be “active” meaning it would be releasing significant calcium carbonate into the soil (disrupting the clay’s platelet alignment) and would be actually be considered marl. I imagine the degree of plasticity to the soil would be the shorthand method to determine this, although I understand if you pour a strong acid on a limestone soil, it will visually start carbonization (fizzing). Could it be, that in marketing of limestone as the key factor in developing the legend of Burgundy, the Burgundians may have swept the subjects of claystone and shale under the rug? Worldwide, most clayey soils develop from shale deposits. Geologist Francoise Vannier-Petit uses the word shale to explain clay to importer Ted Vance in his writing about his day with her. In fact, she virtually used the term clay and shale interchangeably. However, other than that writing, I have never seen the word shale used in Burgundy literature. This might lead one think that shale is not existent on the Côte. Clayey soils are a large component of the great white villages of the Côte de Beaune however, and ignoring shale as a major source of this clay may be a mistake. Vannier does mention alternating layers of limestone and claystone in Marsannay in the marketing material the Marsannay producer’s syndicate produced which I discussed at length in Part 1.3. Could it be, that in marketing of limestone as the key factor in developing the legend of Burgundy, the Burgundians may have swept the subjects of claystone and shale under the rug? Wittendal uses “Clay with silicate sand” as one defining soil type in his statistical analysis of Burgundy vineyards. He does not give a percentage breakdown he is using for this soil type. However, reaching again to the Glossary of Geology, the most straightforward of definition is attributed to Geologist Francis Shepard: “An unconsolidated sand containing 40-75% sand 12.5-50% clay and 0-20% silt.’ (Shepard 1954)“. Unconsolidated means that it is not hardened or cemented into rock. 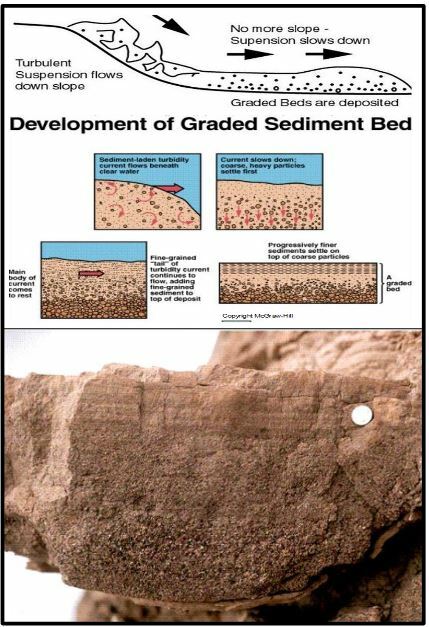 Of note: the definition attributed to Shepard is slightly at odds with the diagram to the right which Shepard is most known for, which has clayey-sand contains no more than 50% clay. The definitions of clayey-sand and loam clearly overlap. At one extreme, Clayey-sand can also be defined as a loam. Clay-loam is a soil that contains clay (27-40%), sand (20-45%), with the balance being silt, all of which have very different particle sizes. If you apply the lowest percentage of clay 27%, and a high percentage of sand 45%, and the remainder, silt at 28%; this combination doesn’t somehow doesn’t seem to fit the description well. 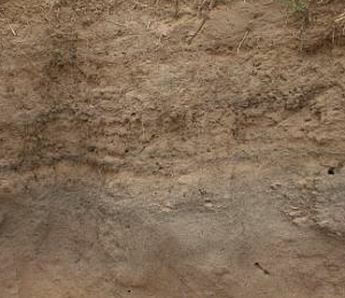 Clay-sand is overlapping with clay-loam but generally consists of 60% sand, 20% silt and 20% clay. 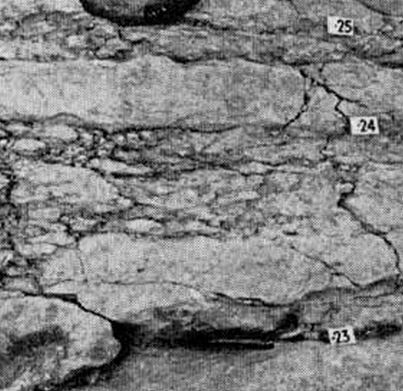 Clayey-silt In 1922 geologist Chester Wentworth defined grain size. Clayey-silt thusly is 80% silt-sized particles, no more than 10% clay (which particles are substantially smaller), and no more than 10% coarser particles of any size, though this would be primarily of sand-sized and above. Conversely, Francis Shepard’s definition of clayey silt in his 1954 book, is 40-75% silt, 12.5-50% clay and 0-20% sand. Colluvium and breccia are very similar. They are both rubble that has amassed on a resting place on a slope. Breccia has a more specific definition, being at least 80% rubble and 10% clay, and can be loose or like any soil type, become cemented into rock. Incidentally, that 10% clay ratio has come up again, because just as the marly limestone I spoke of before, the stone will weather primary clay, but rainwater erosion consequently will remove it as the clay gains mass. The stones that form these piles are what geologists refer to as angular because they are fractured from larger rock, they have angular or sharp edges. This remains true until the stone has become significantly weathered by the carbonic acid in rainwater. Colluvium, on the hand, is a construction of all matter of loose, heterogeneous stone and alluvial material that has collected at a resting place on a slope, or the base of a slope. These materials tend to fall, roll, slide or be carried to the curb of the slope as scree (those loose stone that lies upon the surface) or washed there by runoff. 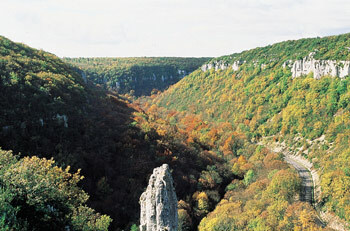 In Burgundy, the rocks of colluvium and breccia are likely mostly limestone. Rocky soils, such as colluvium and particularly breccia, are less prone to compaction because of the airspace is inherently formed between the rocks as they lay upon one another. This protection against compaction should not be overlooked as a major indicator of vine health and grape quality these colluvium sites provide. Drainage through a rocky colluvium surface material can be, let’s say, efficient, and this too is a natural defense against soil compaction, because a farmer must be cautious about trodding on wet soils because they compact so easily. Chemical weathering will develop primary clay deposits amongst the stone, and the stones themselves will slow water as it erodes down the hill, likely giving this primary clay significant protection from erosion. Grand Crus on colluvium soils more than one standard deviation. With the most colluvium are the vineyards of Clos Vougeot with a range of σ ( 2 to 2.7) and Romanee St Vivant (1.8). followed by Most of the red vineyards of Corton sit largely on colluvium (1.25 to 1.75) Echezeaux (1.1). Here we find some interesting groupings. First, the grand crus with the most colluvium are generally considered in the second qualitative tier. The outlier there would be Romanee St-Vivant, which while great, is not considered to be in the same league as Vosne-Romanee’s other great wines, Romanee-Conti, La Tache, and depending on the producer, Richebourg. Are high levels of colluvium cause the vines more difficulty than those planted to vineyards with a heavier marl component? Colluvium Creep and landslide, in this case at Les Rugiens in Pommard. The steep slope being Rugiens Haut, and in the foreground, its benefactor, Rugiens Bas. Here is an example of two vineyards that should be separated in the appellation, but both are labeled as Rugiens. But this question rolls back to ratios of how much colluvium there is in relation to how much marl is in that location, what is the ratio to clay to limestone in the marl at each site (which would change the placement of zero (which would change the mean), and lastly, at what point is it no longer colluvium but marl or vice-versa? Colluvium is known to creep, meaning it continues to move very slowly downslope since it is not anchored to the hillside bedrock, rather it rests there. It is not uncommon to see the effects of this creep in tilted telephone poles and other structures on hillsides. Creep is essentially a imperceivably slow landslide. The most obvious creep/slide in Burgundy is the slope of Rugiens-Haut onto Rugiens-Bas, in Pommard. Gravity, being what it is, nothing on a slope is static, and colluvium will, so very slowly, creep. What I write here, is a distillation of the information laid out in the previous articles, and my weaving together all the information to build a picture of the various soil types and the slopes that generate them. Much of this is my own analysis, cogitation, and at perhaps at times conjecture, based on best information. As I mentioned my preface, I had come to some of these conclusions when researching vineyards for marketing information and noticed a correlation between slope and soil type. The research that formed the basis of the previous series of articles, was done to see if the science of geology supported my theory that a vineyards position dictates the soil type there. I think it does. Ultimately the goal of these articles is to lay down a basis for explaining and predicting wine weight and character, independent of producer input, based on a vineyards slope and position. Where science generally begins and ends are with the single aspect of their research. That is the extent of their job. Scientists rarely will connect the dots of multiple facts for various reasons. It can move them outside their area of examination, or it may not have a direct evidence to support the correlation, or the connection of facts may have exceptions. The study of the cote is clearly would b a multi-discipline enterprise. There is no cancer to be cured, no wrong to be righted, and no money to be made off of understanding it’s terroir. So it has been largely left to the wine professional to ponder. These are my conclusions. I encourage you to share yours. 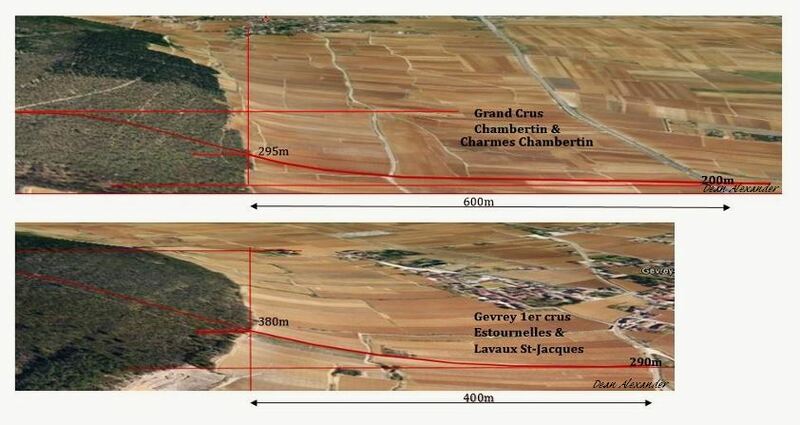 (1 & 2) Vannier-Petit discusses alternating layers of Claystone and Limestone in Marsannay. While I have never read this of the rest of the Côte d’Or, the Côte has never been examined as closely as Vannier-Petit is beginning to examine it now. Layers of claystone may well exist, and given the amount of clay in the great white regions, this may well be the case. Grain flow – Grains in the flow are kept in suspension by grain-to-grain interactions, with the fluid acting only as a lubricant. As such, the grain-to-grain collisions generate a dispersive pressure that helps prevent grains from settling out of suspension. Although common in terrestrial environments on the slip faces of sand dunes, pure grain flows are rare in subaqueous settings. However, grain-to-grain interactions in high-density turbidity currents are very important as a contributing mechanism of sediment support. Liquefied/fluidized flow – Form in cohesionless granular substances. 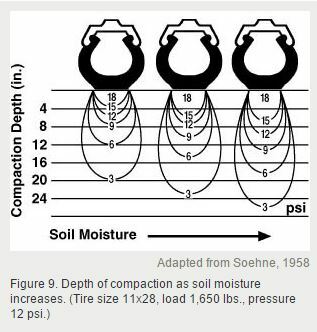 As grains at the base of a suspension settle out, fluid that is displaced upward by the settling generates pore fluid pressures that may help suspend grains in the upper part of the flow. Application of an external pressure to the suspension will initiate flow. This external pressure can be applied by a seismic shock, which may transform loose sand into a highly viscous suspension as in quicksand. Generally as soon as the flow begins to move, fluid turbulence results and the flow rapidly evolves into a turbidity current. 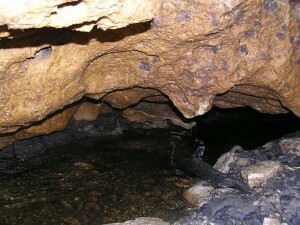 Flows and suspensions are said to be liquefied when the grains settle downward through the fluid and displace the fluid upwards. By contrast, flows and suspensions are said to fluidized when the fluid moves upward through the grains, thereby temporarily suspending them. Most flows are liquefied, and many references to fluidized sediment gravity flows are in fact incorrect and actually refer to liquefied flows. Debris flow or mudflow – Grains are supported by the strength and buoyancy of the matrix. Mudflows and debris flows have cohesive strength, which makes their behavior difficult to predict using the laws of physics. As such, these flows exhibit non-newtonian behavior. Because mudflows and debris flows have cohesive strength, unusually large clasts may be able to literally float on top of the mud matrix within the flow. Turbidity current – Grains are suspended by fluid turbulence within the flow. Because the behavior of turbidity currents is largely predictable, they exhibit newtonian behavior, in contrast to flows with cohesive strength (i.e., mudlfows and debris flows). The behavior of turbidity currents in subaqueous settings is strongly influenced by the concentration of the flow, as closely packed grains in high-concentration flows are more likely to undergo grain-to-grain collisions and generate dispersive pressures as a contributing sediment support mechanism, thereby keep additional grains in suspension. Thus, it is useful to distinguish between low-density and high-density turbidity currents. A powder snow avalanche is essentially a turbidity current in which air is the supporting fluid and suspends snow granules in place of sand grains.